The bodywork on many of today's cars is so low and the tyres so wide that it can actually be very difficult for the motorist to get a good view of the tyres without some deal of effort. However, the perceived difficulty or challenge of properly inspecting your tyres can't be used as an excuse because ultimately, it is the motorists responsibility to maintain safe, legal tyres. A customer came in recently and asked us to look at his tyres because he thought they were getting low. The outside groove (on the left hand side of the picture) was all the customer had seen because without a full, proper inspection, the rest of the tyre was not easily visible. As you can imagine, the customer was horrified when we removed the wheel from the car revealing the steel belts beneath the actual tread rubber of the tyre. Not only had this tyre been illegal for some time but it was also extremely dangerous for the driver, the passengers and any other road users or pedestrians unlucky enough to be in the wrong place at the wrong time if this tyre had failed. Here's the good news. You can drive in or contact us to arrange a Free Tyre Safety Check. As a member of TyreSafe we support and promote tyre safety for UK motorists. We actively encourage our customers both old and new to take advantage of our free tyre safety check. 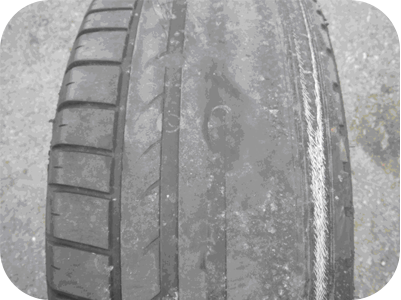 Let's face it, your tyres are what keep you on the road and prevent you from careering off it! Just think for example how the weather changes throughout the year and often in the same day. The varying British weather, as much as we love it :), can change driving conditions and affect the road surfaces that we drive on. Apart from the weather, there are many situations that can influence the performance of our tyres yet we expect our tyres to cope with all situations. But once again, here's the good news; if we maintain our tyres and drive within the law, we can rely on them to do their job. Tyre maintenance basically involves running your tyres at the correct pressure and keeping an eye on the overall tyre condition looking out for irregular tyre wear, cuts or damage to the tyre tread and sidewalls. Look after your tyres and your tyres will look after you!